Some argue that email clichés, although they’re mostly meaningless, do have a purpose. Although you may not actively wonder whether the person you’re emailing is doing well, or whether they’ll have a great day, you were at least thoughtful enough to begin and end your email with those polite sentiments. But if you’re tired of typing the same stock lines—a sort of email autopilot—there are some simple ways to change things up and take your email from utilitarian to unique. “Hi, Name” is a perfectly legitimate way to begin most emails, although that can depend on the email’s context. But what happens directly after the salutation? How do you greet your recipient? Here are a few common greeting clichés and some alternatives. We use this one a lot. In fact, it’s so pervasive that most of us skim right past it as we’re reading our incoming emails. It’s accepted as polite, and few people get outright annoyed by it, but there are options if you’d like to change things up. Jump right in. There’s nothing wrong with getting straight down to business. Just read through your email before sending it to make sure you haven’t come across as abrupt or unfriendly. Although they’re usually necessary in some form or another when you email someone you don’t know well (or at all), introductions can be dull. Here are a few tricks to try. This one sounds too officious and formal. Worse, it can come across as demanding, or even aggressive. You messed up. It happens. But a canned apology doesn’t have to. We all forget to reply to important emails from time to time. But calling attention to your mistake only makes things worse. 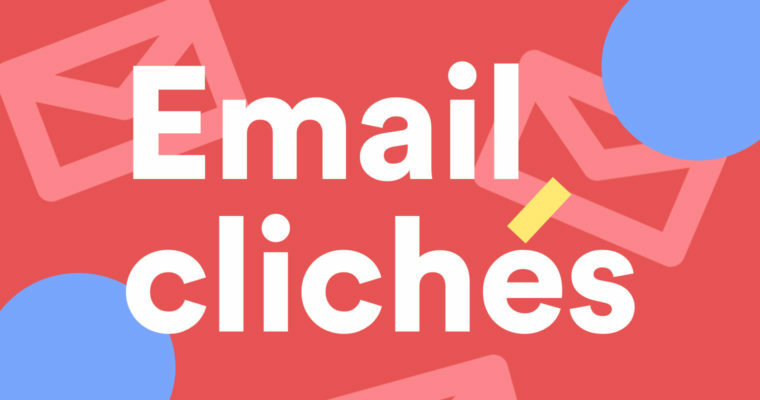 You’ve taken the time to craft a unique email, so don’t get clichéd on the sign-off.